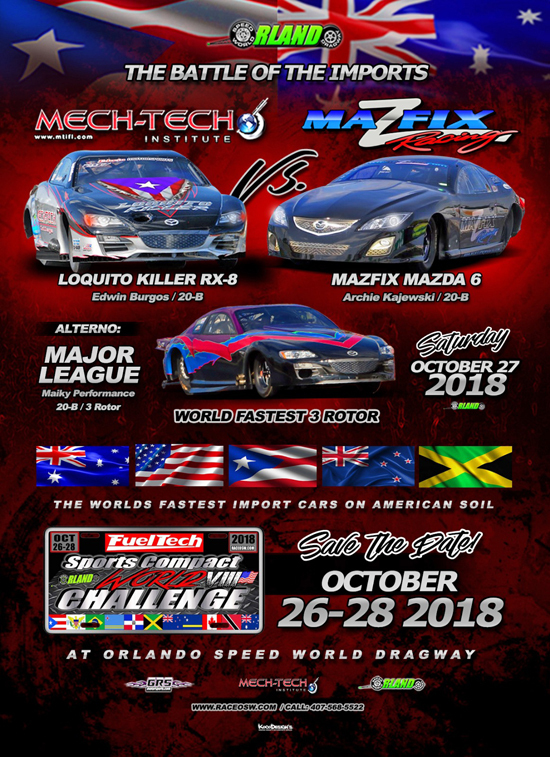 The 23rd annual Haltech World Cup Finals - Import vs. 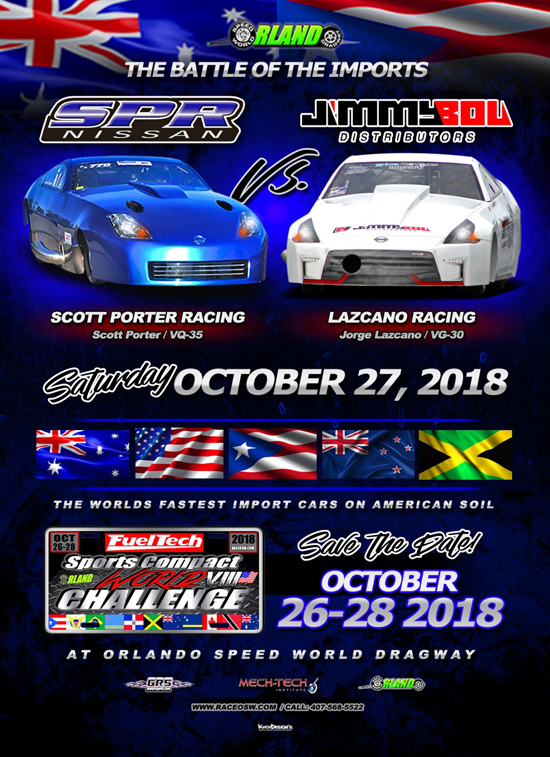 Domestic event produced by Miller Brothers Productions (MBP) will take place at Maryland Int'l Raceway on October 31 - November 4, 2018. 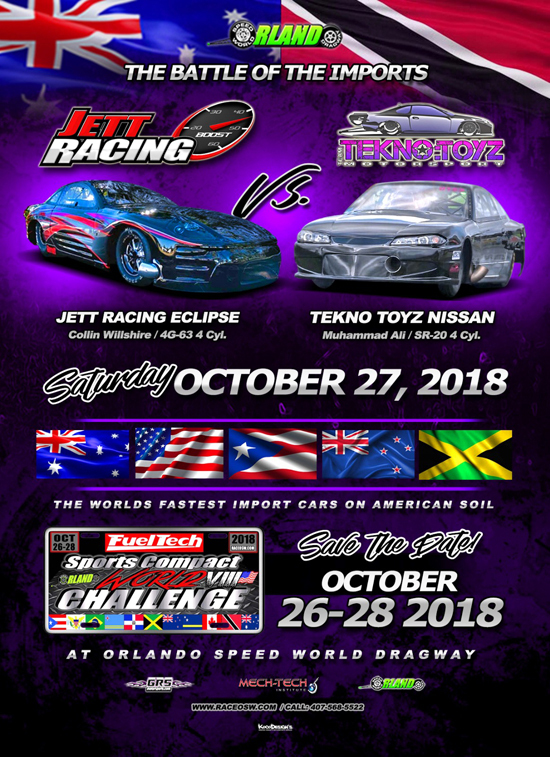 The event features Import vs. 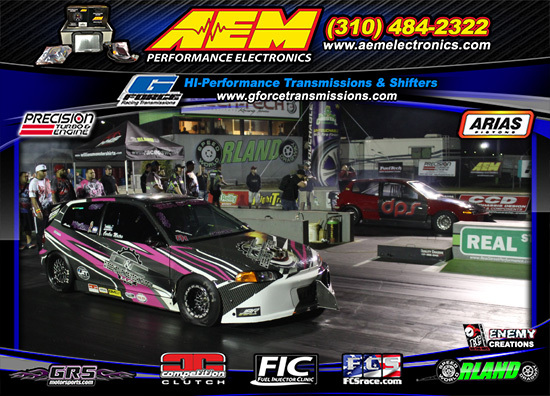 Domestic Drag Racing, a Custom Car Show, IBT Bikini Contest, a Huge Vendor Midway, and a Live DJ! 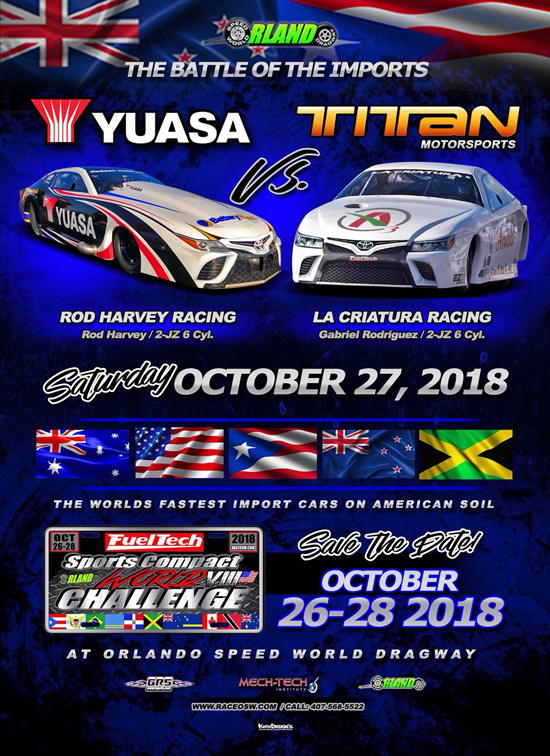 The event is busting at the seams with over 30,000 fans in attendance, and there is no other event like it on the planet! 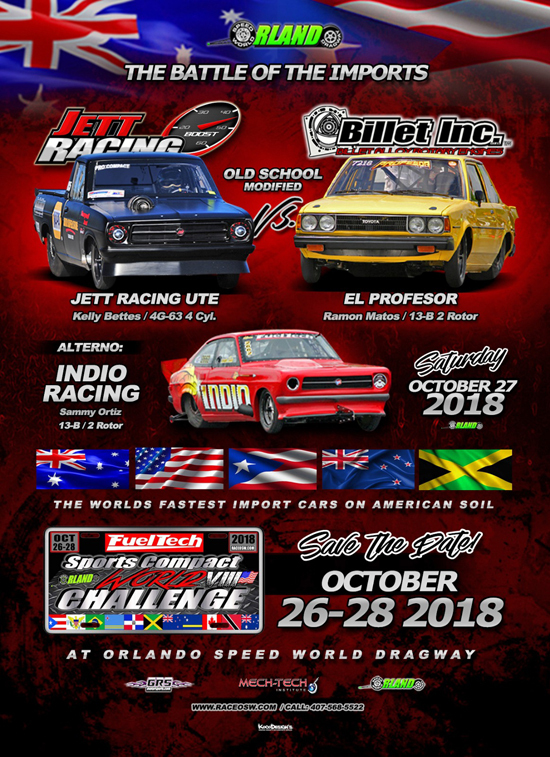 The WCF event breaks more class records than any event on Earth due to Jason Miller's legendary track prep and unparalleled cool and dry atmospheric conditions that only exist this time of year! 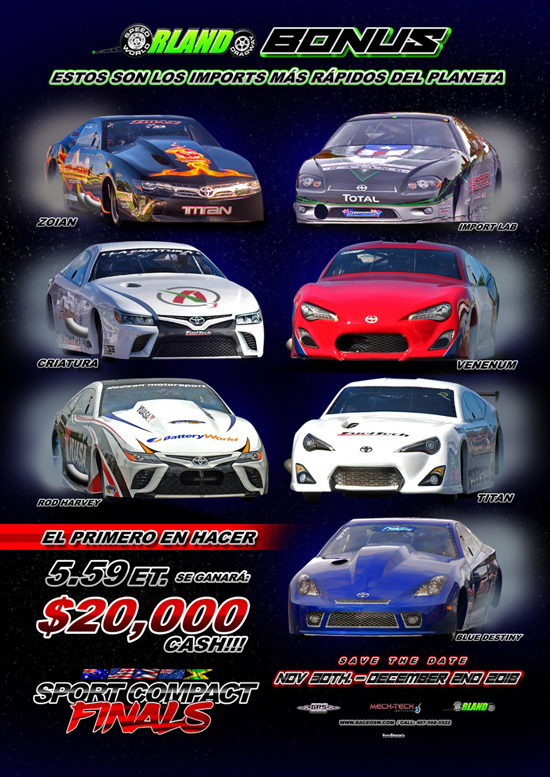 Racers come to this event to obliterate records and make history! 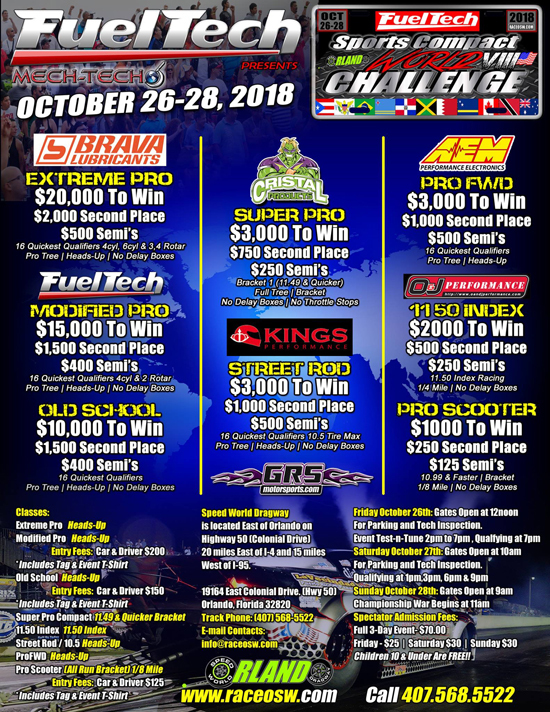 The event draws 370 Heads-Up racers from over 10 different countries competing for over $110,000 in ten different classes of competition: Mickey Thompson Tires - Outlaw vs Extreme, ATI Performance Products - Radial vs Modified, Precision Turbo & Engine - X275 vs Hot Rod, King Racing - Warriors vs Tres Cuarto, JPC Racing - Street Fighter, Fuel Injector Clinic - Wild Street, Real Street Performance - Super Street, Driveshaft Shop - True Street, Competition Clutch - All Motor and Platinum General Services - Pro Street Bike. 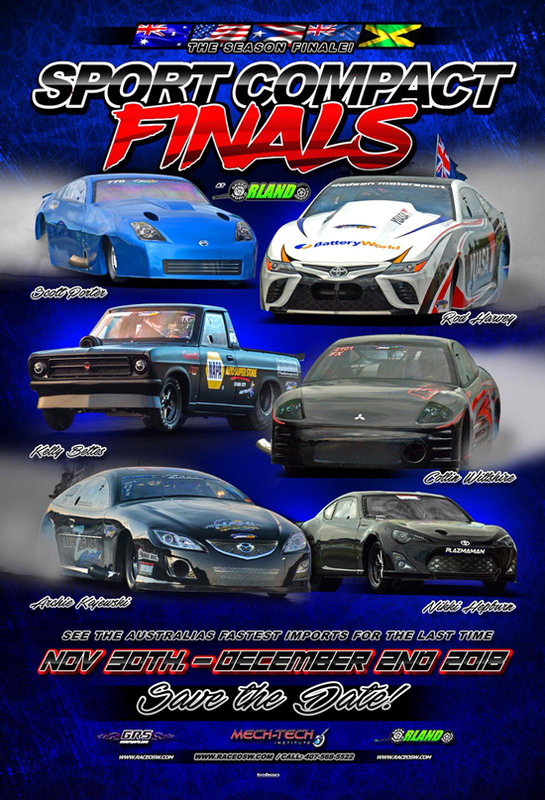 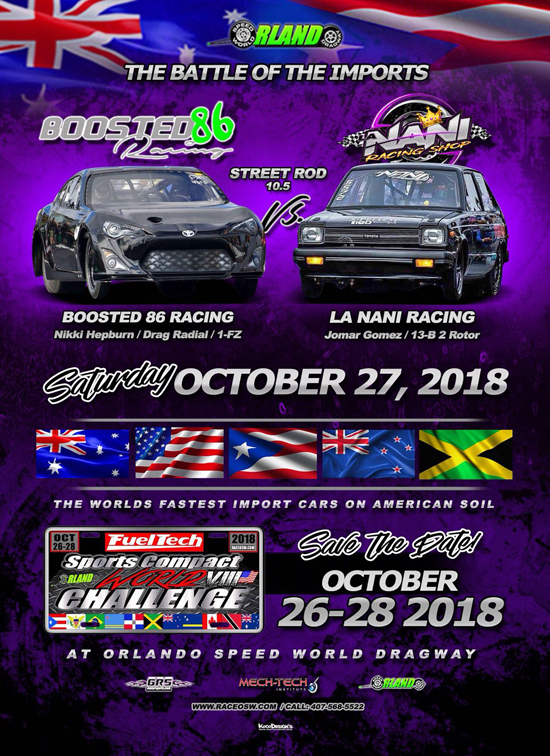 The event brings you side by side racing action from just about every type of genre in drag racing featuring the top cars from just about every sanctioning body in the country! 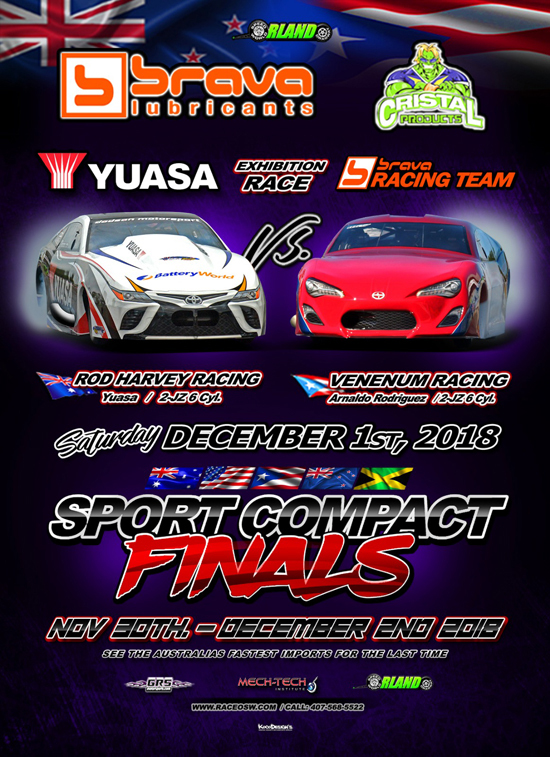 Forget the trash talking, it's time to prove that these drivers have got what it takes, with each side putting their reputation and egos on the line! 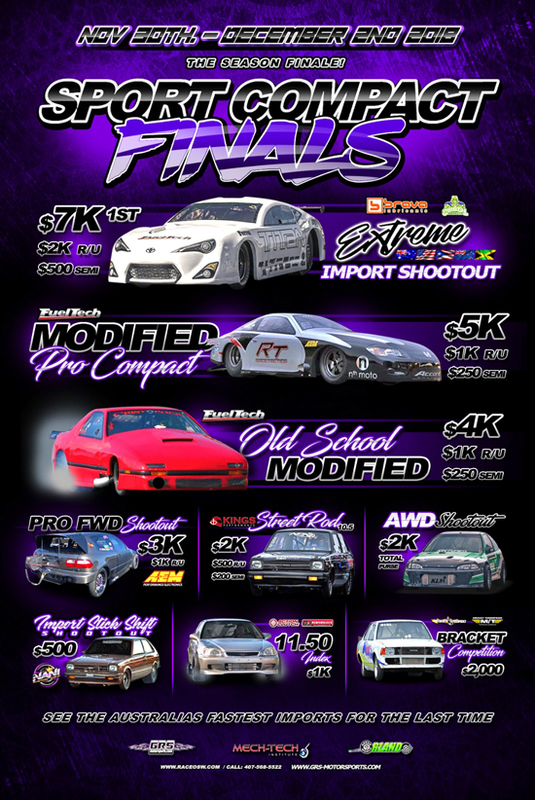 The pit area also features a Custom Car Show on Sunday with trophies and cash prizes awarded. 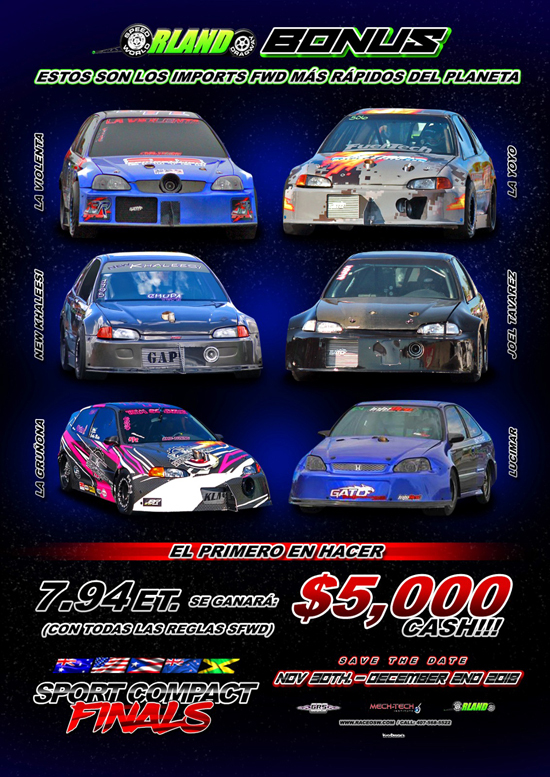 This show features beautiful cruisers, classics, hot rods, tuners, low riders, and exotics. 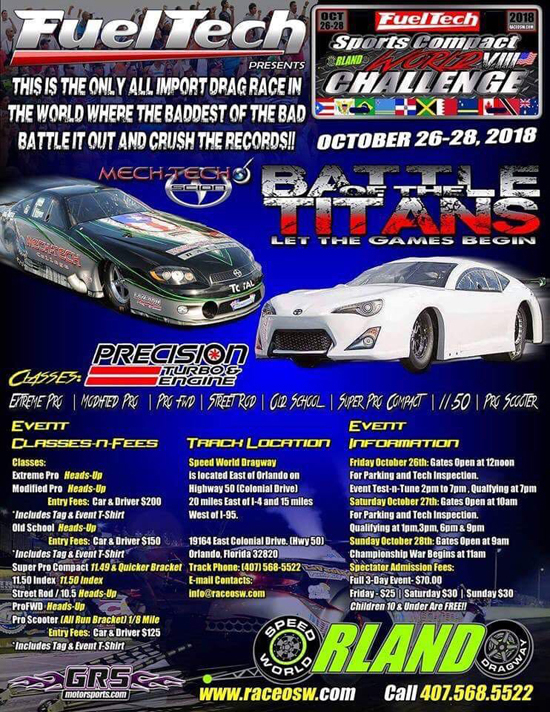 All Car Show entries must pre-register for the car show. 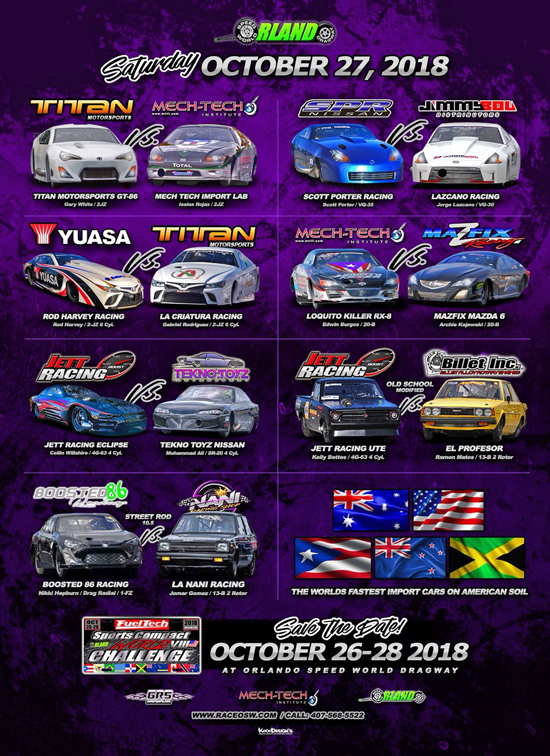 The International Bikini Team kicks off the Bikini Contest presented by Victory Precision Machine on Sunday and is always a crowd favorite at WCF! 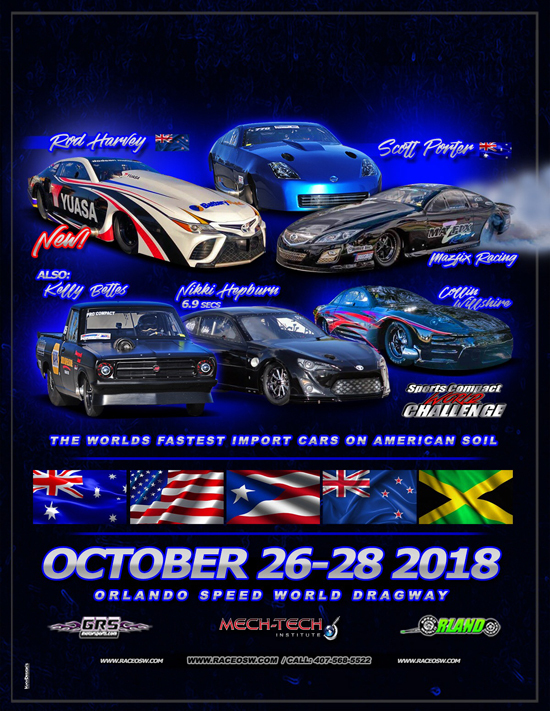 Also, be sure to check out over 2,300' of vendors on the vendor midway where you'll find performance parts, accessories, and apparel at great prices! 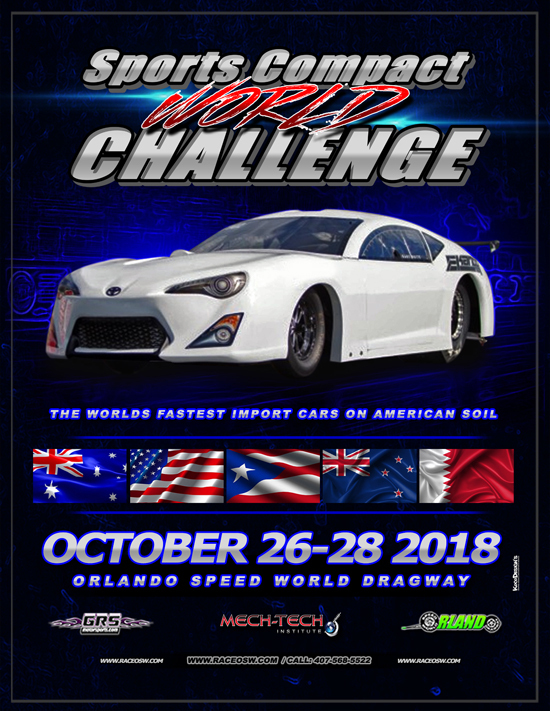 Also please make note that spectators are not permitted to bring Golf Carts, ATVs or other Pit Bikes to WCF. 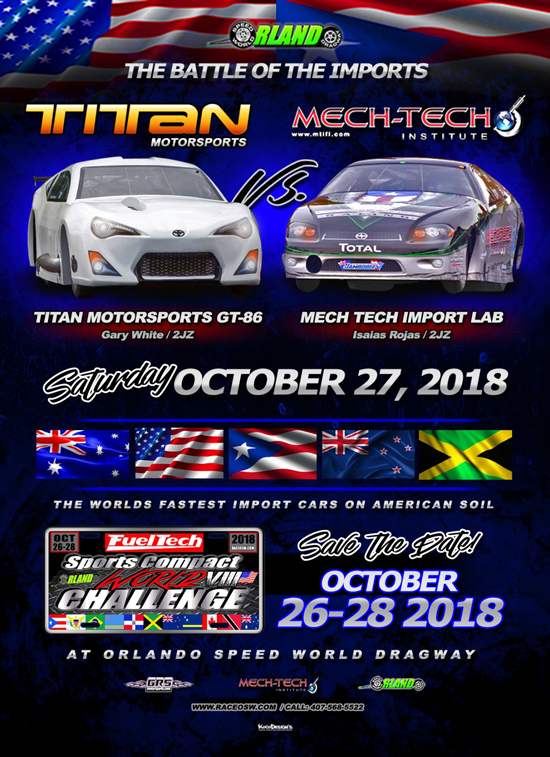 This is strictly enforced. 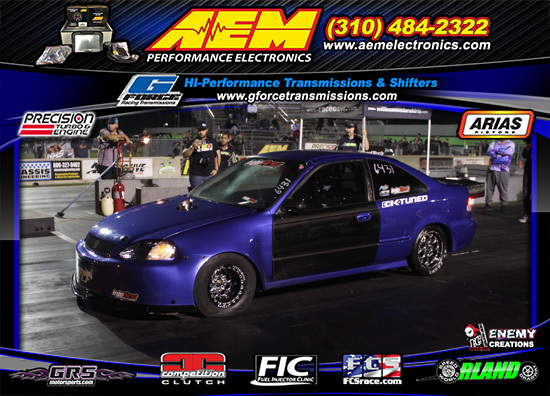 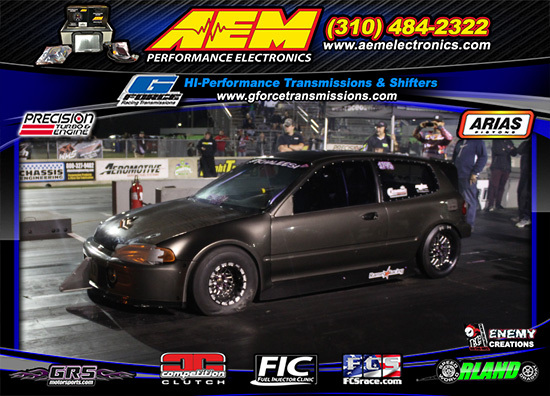 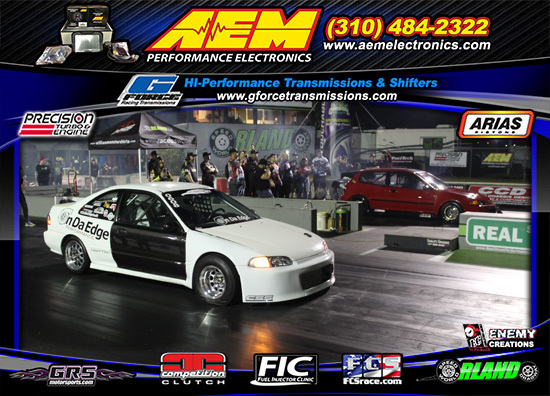 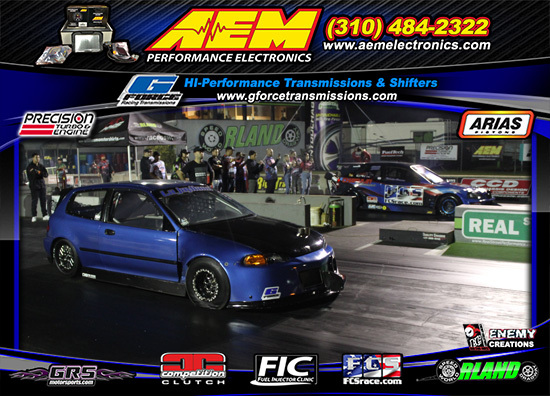 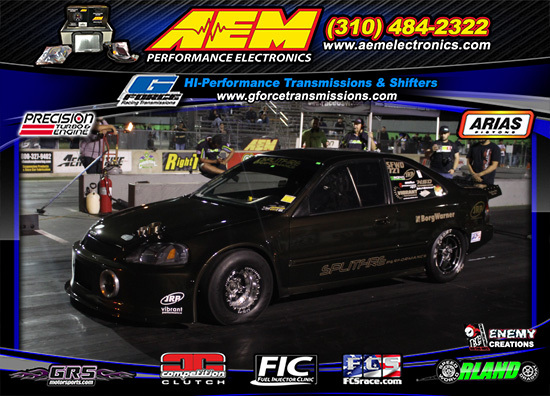 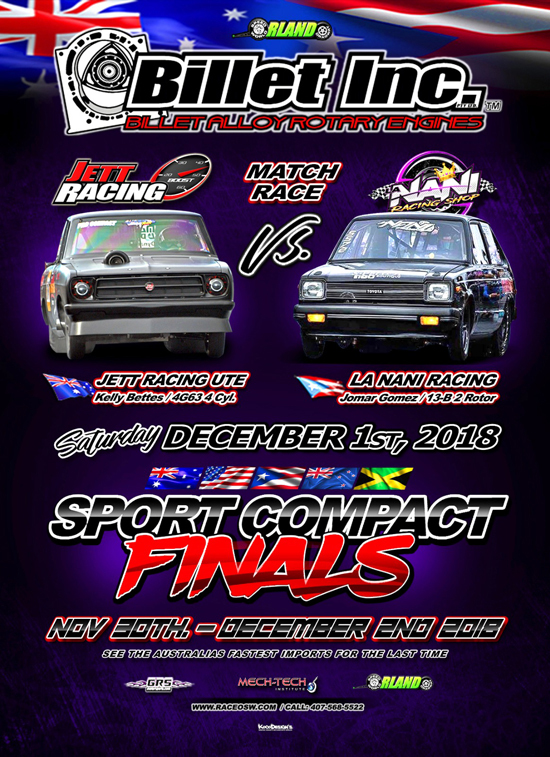 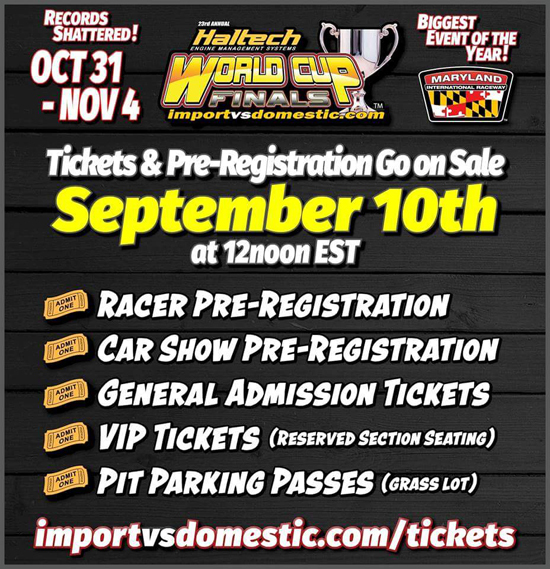 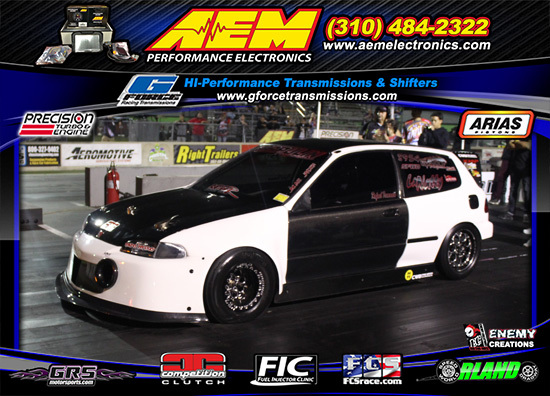 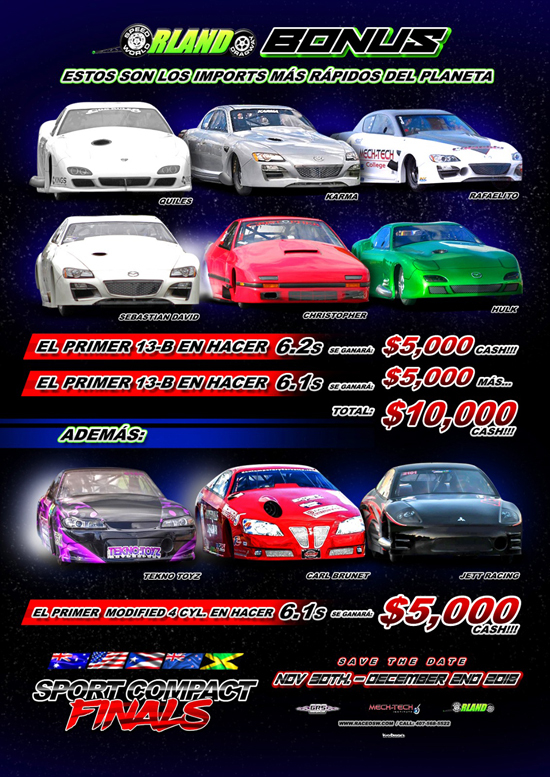 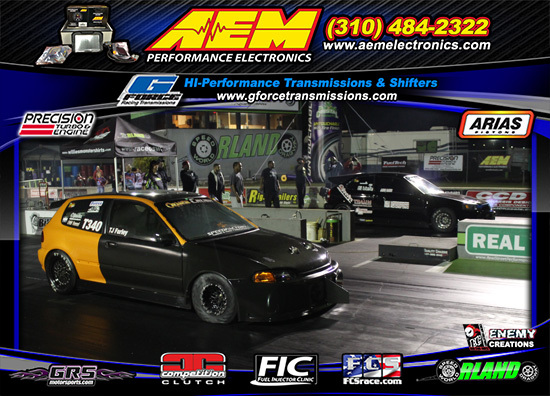 So be sure to mark your calendars for the 23rd annual Haltech World Cup Finals - Import vs. 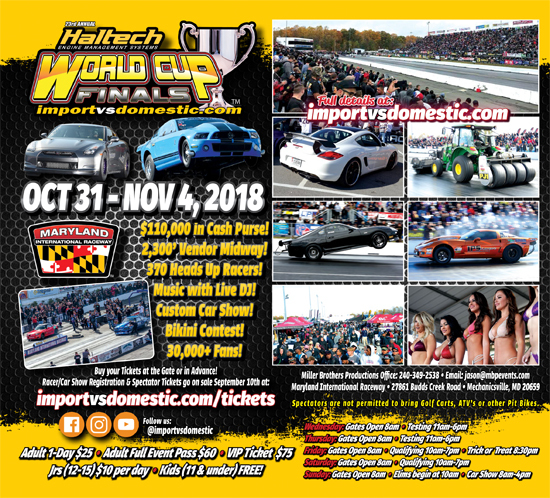 Domestic event at Maryland Int'l Raceway on October 31 - November 4, 2018 for the best show in drag racing! 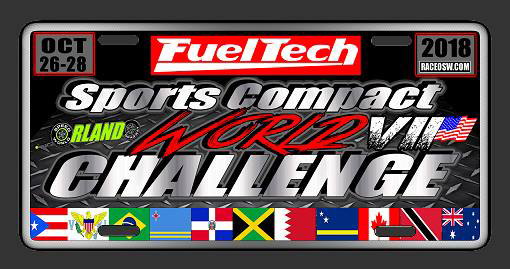 The Haltech World Cup Finals is for the best of the best only! 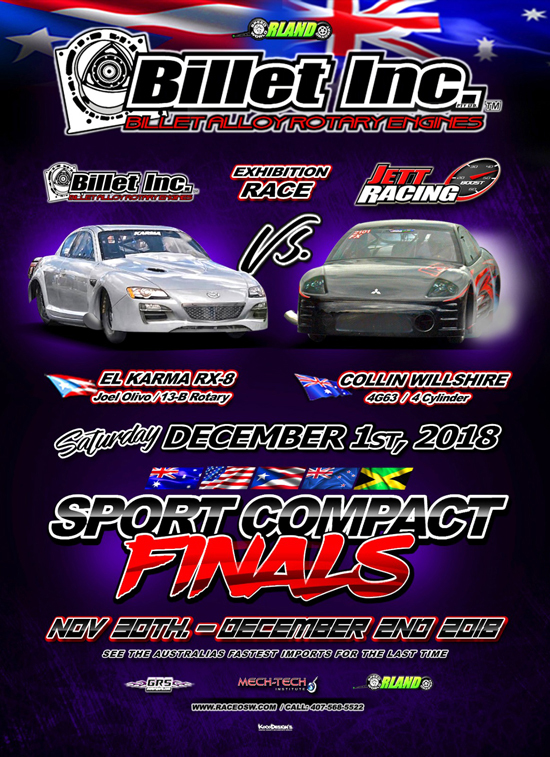 We have a strict Minimum ET policy to eliminate down time from unproven cars, create more side by side racing, and provide a great race to the fans! 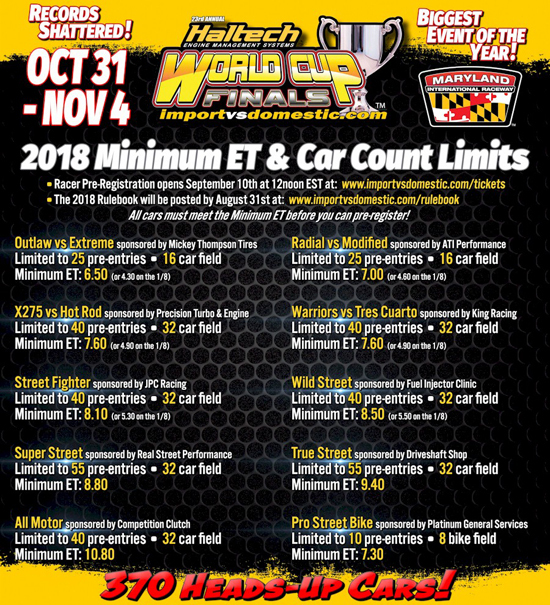 The Minimum ET's have been lowered in 2018 to an even quicker time for each class. 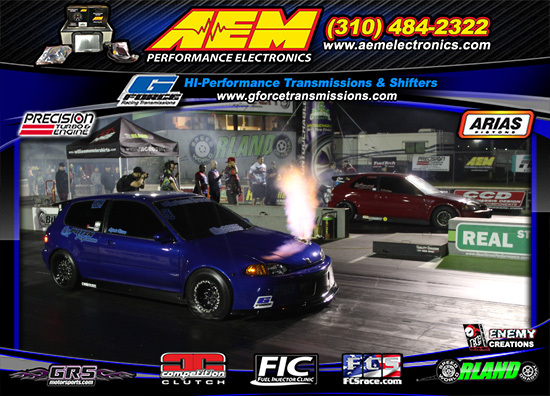 If you haven't met the NEW Minimum ET yet, be sure to start testing now and get it on video. 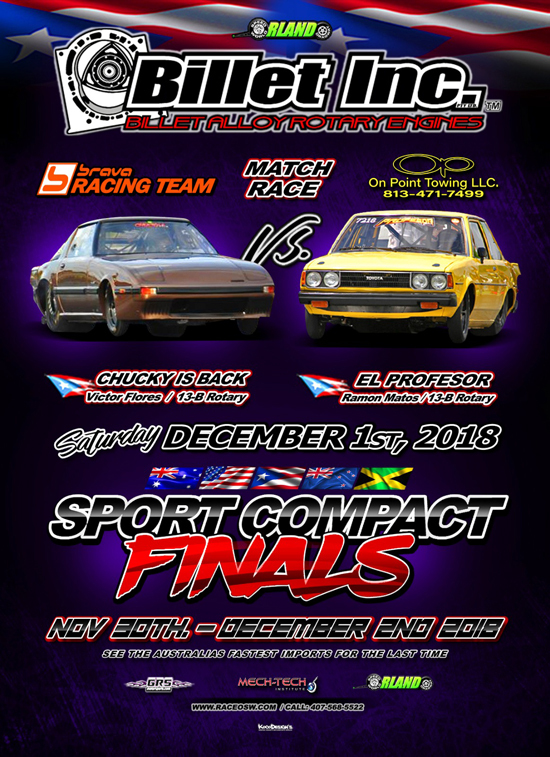 You cannot pre-register until your car has met the Minimum ET, so you don't take an entry away from a car that has met the Minimum ET.